Friends, family, and loved ones will be able to find your house easily with an LuxCraft Garden Wishing Well with Cedar Roof-Jumbo size on the front lawn. 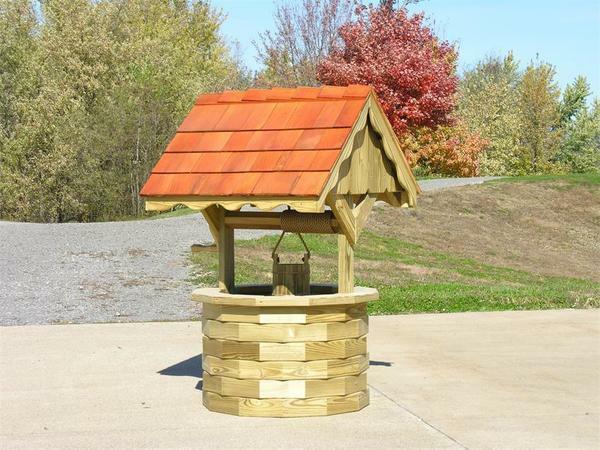 This delightful Amish wishing well is our grandest size and comes complete with a cedar roof and generous well bucket. Little ones will love to gather around your Amish wishing well. They will be entertained with the crank that turns to lower and raise the well bucket. Plan on special family photos outside with your delightful Amish well to enhance your outdoor scene. This Amish well is available in Small, Medium or Large sizes with the Jumbo size being our grandest well of all. Also as an option you can customize the dimensions for an additional cost. Handcrafted in Ohio by skilled Amish craftsmen, this LuxCraft Garden Wishing Well with Cedar Roof is made of pressure treated kiln dried yellow pine. Have you heard about yellow pine wood benefits? Be sure to review our wide selection of Amish Outdoor Garden Decor to highlight your beautiful garden and yard. Call one of our Amish Furniture Specialists today at 1-866-272-6773 with any questions.